The Museum is pleased to announce John Goodwin as the new Major Gifts Officer. Goodwin joins the senior leadership team and takes on a role pivotal to the future of the Museum and region’s arts community. Goodwin will help spearhead fundraising for the Rothko Pavilion and associated renovations designed to make the 126-year-old museum more accessible to the public. To date, donors have contributed nearly $33 million for the capital project. “John Goodwin is a remarkable leader in our city and state. His deep knowledge of art and its role to educate and inspire is an extraordinary attribute. As a docent, member and a trustee, John’s contributions to this institution have already been significant. 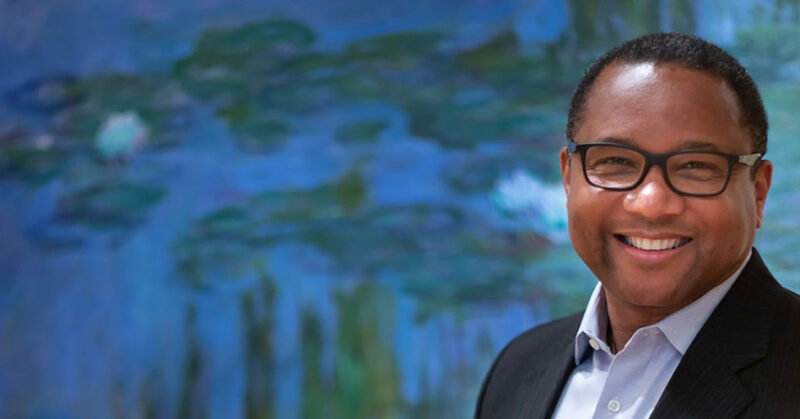 I am thrilled that he will now partner with my team and me on a daily basis to realize our exciting vision for the future,” said Portland Art Museum Director Brian Ferriso. Goodwin comes to the Museum after working six years for the Portland Trail Blazers where he is currently Director, Premium Experience. His previous employment also includes the University Club of Portland and the Benson Hotel. Goodwin describes the Museum as a natural next step for him and his career. Goodwin’s passion for the arts began when he was a boy growing up in North Carolina. The youngest of seven, Goodwin accompanied his mother to art auctions and yard sales. As a middle-school student, Goodwin went door-to-door selling prints showcasing famous artworks. As an adult, Goodwin believes art should be seen and shared. Goodwin served as an Associate Director of the Center Art Gallery in Honolulu. Shortly after moving to Portland in 1994, he became a volunteer docent at the Portland Art Museum. Goodwin joined the Museum’s Board of Trustees in 2015. He also serves on the board of the Oregon Cultural Trust and is a former board member for Disjecta. His own art collection is “eclectic,” Goodwin said, adding that he is drawn to art about or by African Americans. He and his partner, Michael-Jay Robinson, loaned “The Crazy Conductor” a chalkboard painting by Gary Simmons for exhibit at the Portland Art Museum and the Museum of Modern Art in New York City. Robinson has also shown his work in a Portland Art Museum group show years ago. Goodwin will step down from the Museum Board of Trustees when he begins his new job on August 13.